Who exactly is Hillary Clinton? Because as her candidacy for President has been announced ahead of 2016, and she could well become the first woman ever to be U.S. President, the question becomes all the more relevant … and important. Fortunately, woman’s biographer Alma H. Bond, a Manhattan psychoanalyst for 35 years, has read just about everything ever published about the former First Lady, U.S. 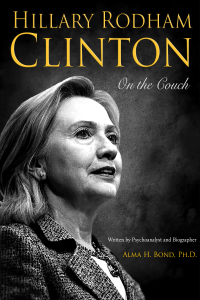 Senator, and Secretary of State, and has written a fascinating, highly readable, and intimate book burning through a great many myths about HRC. AUTHOR’S FIRST NAME: Dr. Alma H.
Cute approach; could relate it to the theory of Hillary as the only fly on the wall of one President in the Oval Office to conclude that she could do that, run, and occupy the Oval office herself. wHat a kick! Anyway it’s looked at, it’s legendary!